If only to further emphasise some of the fundamental rebuilds APEX 5 must have undertaken, look at the ability to switch region types. 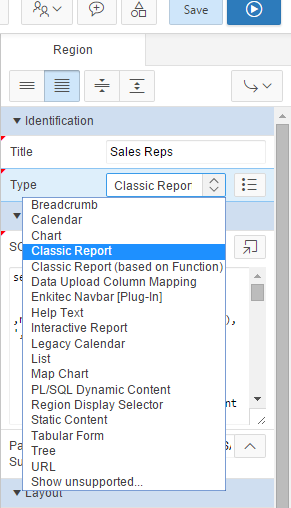 Prior to APEX 5.0, we could migrate a Classic report to an Interactive Report, but not the reverse. And don't even think about switching to another region type. Just bear in mind the tweaks and adjustments you'd probably lose as you toggle around. I think it speaks more about how even more the APEX toolset fits in the RAD category, and how much neater the backend must be to make this happen. This flexibility certainly helps a step in our course where we ask students to create a classic report. No matter how clear the instruction, there's always someone who creates an interactive report. This will make it easier to switch back! Also note the "Legacy Calendar" type. This is what helps makes APEX backwards compatible, ensuring version upgrades go more smoothly by minimising the internal changes to applications. Though the same can't be said for plug-ins, where you'll probably where most of your upgrade pain.